"Rescheduling In The Northern Forest!" 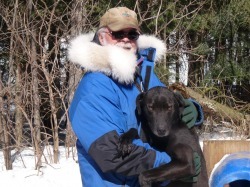 Flexibility is a part of Dog Mushing, as things are always changing. This week, the decision was made to not attend the last scheduled race of the season for us. The main reason being that Roxy suffered a slight wrist injury at the race in Nicolet and the decision was made to not run her for the balance of the season to ensure the wrist heals properly. Roxy is the dominate leader in the Open Team to ensure stability in performance. It is more important here for her total recovery than risk further damage for the sake of one more race. Roxy's persona was the missing link in the Open Team to ensure us trouble free performances at the races. She did a great job this year and has been enjoying her recovery time in the chalet with us at night. With this decision, we have been spending more time working with young leaders for next season and getting more running time for some of the young dogs. Last week, we explored and opened up some new training trails on the other side of the lake. We have a nice 6 mile trail as well as a 10 mile trail. We will use these trails more next season as soon as the ice on the lake is safe enough to cross. Also with next season in mind, Bergen and Blue were bred this week and if all goes well puppies should be born around early May. The decision to breed both of these dogs in due to their solid performance in the team every time they run. Also Bergen is a leader and has produced leaders when bred at Valerie & Laurent Gonsolin's kennel. There pedigrees are a good match for a line breeding that should ensure good puppies. The weather finally has warmed up in the later part of the week, making us think that Spring is getting closer. February was the coldest on record here.